Water is one of the most important components that makes up our body and is crucial to various life processes. In order to meet the demands of water on a daily basis, we depend on several sources. Most of us get our water supply from a bore well, corporation water or use bottled and canned water. Rarely do we pay attention to the content of these sources and take them for granted. This article is just a piece of information for you about what the various sources of water contain and where they come from. Corporation water: Corporation water is sewage treated water. This is done by the government of that particular state. Here, the main reservoir of sewage water is subjected to different types of processes like filtration, aeration, and different mediums for purification and then supplied to each house for general usage. This type of water is good to drink and cook if filtered well. Bore well water: Bore well water is underground water that is extracted for usage. Bore well water is usually hard water. One has to remove hardness and the salty taste of water. To do that, water has to be boiled and filter in normal candle-type water filters. These filters are available in plumber shops. Unless the salt is removed from the water, it is not very safe. Too much of salts to the body can create water retention and other problems. Bottle and can water: As of now, bottle and can water is being used quite rampantly across the city. Most of these could be safe if bought from an established brand/company. The only drawback with this source is that it is packaged in plastic. Moreover, these cans are used over and over again, and this can cause leaching into the water. One should know if it is reusable plastic. Bottled water and can water is the same water that is tested - corporation water. These are the main sources of water available to us. 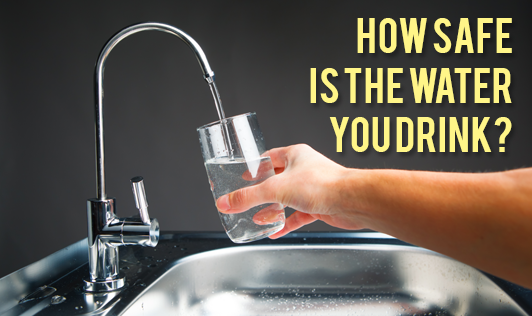 Though most of these sources are "meant" to be safe for consumption, it is important for every family to keep a check on the quality of water being supplied to you. Doing this can go a long way in protecting you from several water-borne diseases.